evangelizing the (digital) natives : You're Teaching With Digital Immigrants. It's OKAY. You're Teaching With Digital Immigrants. It's OKAY. 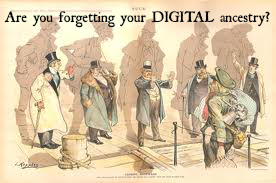 Most of the teachers in our schools are digital immigrants. Own that. Appreciate that diversity. My sister, @jenbearden, made a post on her teaching blog Sunday about her struggle with being defined as a digital immigrant, but wanting to feel like a digital native because of her teaching practice and (positive) attitudes toward change and innovations. "So like I said, I am somewhat of an Immigrant just because of my age, but that definition doesn’t ring true at all with how I think/believe/feel about myself, my students or learning in general. I do think learning can and should be fun, I did spend my formative years learning with Sesame Street, Mr. Rogers and the Electric Company, and I am a MASTER at multi-tasking (i.e. learning while watching TV and/or listening to music–I’m doing it right now, actually). Perhaps its like with any definition or rule, there’s always an exception. And in this case, an exception is what I long to be. " She ended with this question: "So what do you think about the digital natives, digital immigrants and Web 2.0? Which are you? How does knowing about digital natives impact the way you teach and the way your students learn?" As far as immigrants and natives – they are diametrically opposite; you cannot put the words together! That’s cheating. You’re obviously a naturalized citizen of the digital world at this point (I think I skipped in as a digital native at like, the, you-were-born-in-a-US-embassy level, LOL), but you’re still an immigrant because of your ed experiences growing up. There was a period where you had to train yourself that it was “normal” to do all of your work and learning on a computer. I mean, I know your prior knowledge was above the level of the class, but I was in the living room when you were doing college homework learning the parts of a computer and how to use a mouse. You’re an immigrant, own it. It’s what makes this [digital] country so great. The article that sparked her post was published by +Marc Prensky in 2001: "Digital Natives, Digital Immigrants". The definition comes down to this for me - a digital native is one who grew up with digital technologies have a vein in every aspect of their socialization and learning; a digital immigrant is one who at some point had to adopt and assimilate something they had previously learned to digital mediums or methods. If you weren't (at least) emailing, myspacing, or facebooking friends in high school, I don't think you're a digital native. AND THAT'S OKAY. According to the US Bureau of Labor Statistics, in 2008, there were 4.8 million K-12 teachers in US schools. So, there are least least A COUPLE MILLION teachers who are NOT digital natives. What does that have to do with your colleague down the hall that can't attach a file to an email? If you're a "naturalized" digital citizen, I'm sure you relate to this. Just as there are varying identities that immigrants wear in the US (fully "Americanized," naturalized citizen vs maintaining all native language, culture, and customs), there are different identities of digital immigrants teaching in our schools. Here's what I've found - Once you expect that teachers in your building are at different degrees of tech integration and allow for them to develop appropriately, you and those you're helping will both feel more success. NEVER put all of the staff in one, one-size-fits-all session. 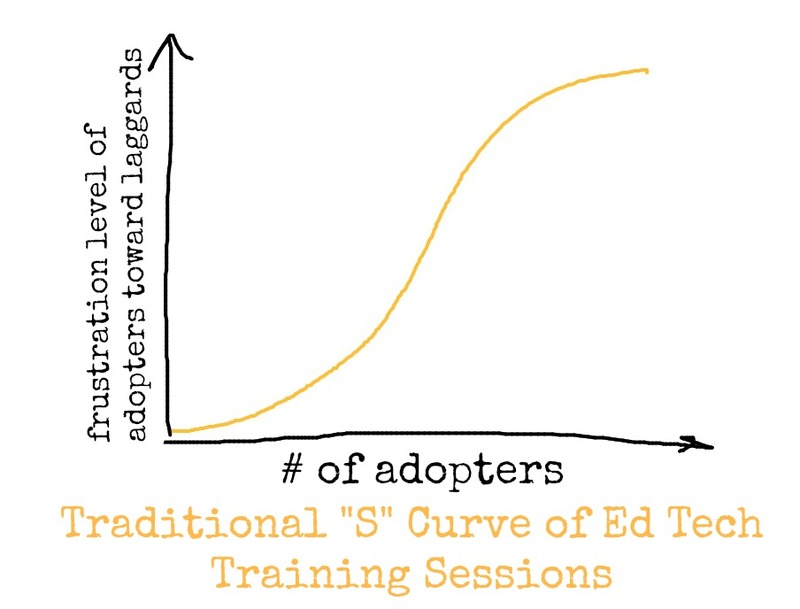 The people in the middle of the curve will probably learn something, but at least a 1/3 of the group at the bottom and top of the curve will be bored/lost. Whenever possible break into developmental groups. 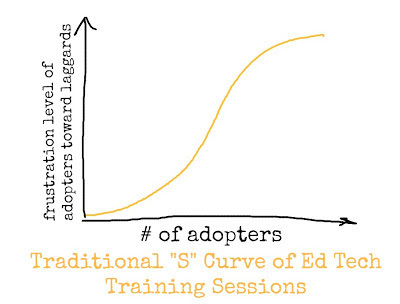 Pre-train a handfull of the early-adopters in your building so they can peer-tutor and maximize your training results during the larger session. Provide mastery goals for implementation of the instructional strategy or technology tool. When we switched over to Google Apps in July 2012, for some of our staff in the district, learning how to rebuild the contact list in their new email from the old mail system was a huge undertaking. And truthfully, mastery of email really was the BASIC level of implementation required. For others, however, we've tried to model implementation levels for using Google Docs for classroom instruction, and even to the extent of students using Google Docs. Until people born in the early 80s begin retiring, we're going to have digital immigrants teaching digital natives in our schools. As long as they're making some kind of effort toward naturalization, its important to offer grace and patience in our efforts to train.